As I pondered the Bible readings we have heard tonight, I was reminded of an old saying: “So heavenly minded, they’re no earthly good.” I haven’t heard it for a while, but it used to be used of people whose religious preoccupations left them just about incapable of engaging with the day to day requirements of ordinary life, work and relationships. “So heavenly minded, they’re no earthly good.” It was never a compliment, and often I remember thinking that it was levelled unfairly as a way of trying to rein back in anyone who was taking their faith and discipleship “too seriously”. But I have also met people of whom it seemed perfectly fair! Truth be told though, it can be a challenge to work out just what it means to live in the here and now when you are a follower of Jesus. If you are looking forward with hope to the day when all things are made new and the culture of God is fulfilled, what does that mean for how you are to engage in the ordinary day to day realities of life in a world which mostly cares nothing about such hopes? Do our hopes for how the world will one day be cut us off from of living in the world the way it is? Should we stand back from this world and treat it with disdain because we are waiting for a new and better world? Do our hopes for tomorrow mean that getting on with the business of life today would be compromise and unfaithfulness? We are far from being the first of God’s people to ever face such questions. 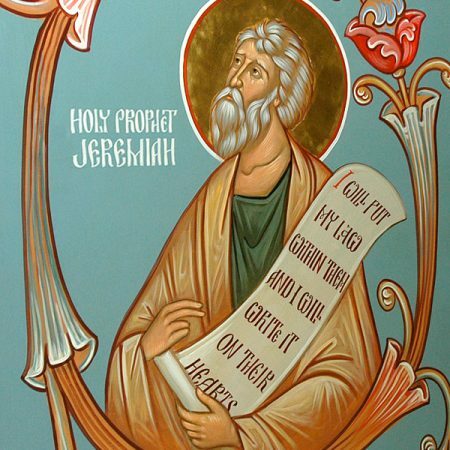 The first reading we heard tonight was from the prophet Jeremiah, and it was his message to the people of Jerusalem whom Nebuchadnezzar had taken into exile in Babylon. The question that Jeremiah is addressing is essentially this same question we are asking. The people had no desire to be in Babylon. We heard about that last week – “by the rivers of Babylon we sat down and wept.” They were there against their will and they were longing and praying and believing for a day when the exile would be over and they could go home to Jerusalem and start their lives over again. Today everything is all wrong, but one day it will be put right again, and then we will truly be able to live. They fervently believed that God would one day restore their fortunes and bring them home. But how should they live and act in the mean time? One option was the “so heavenly minded as to be no earthly good” option. They could fix all their hopes and all their attention on the anticipated tomorrow. They could look down their noses at everything to do with their present circumstances and refuse to engage with it. They could say “none of this is anything to do with us” and devote all their energies to planning and preparing for the day that was one day to come. We see extreme versions of this in some of the doomsday cults that pop up from time to time. People become persuaded that the end of the world is nigh and that Jesus is about to return in glory, so they quit their jobs, sell their homes and cut all ties with ordinary life as they wait to be snatched up to heaven. Or the version I most often fall into: “If I can just get through this busy period, then I’ll be able to get everything together and live the way I know I should be living.” I’ve been kidding myself with that one for decades, and the busy times still keep coming as inevitably as the waves on the sea. What all these ideas have in common is the belief that nothing worthwhile can happen in the present circumstances, and that the things that would really make the decisive difference to my life are not things I can do myself, or things I can influence. They are external and in the hands of someone else. They are things I just have to wait for, and when they finally happen, then everything will be changed for me and I’ll be able to really live life as it is supposed to be lived. This is, of course, a comforting thought, because if it is true, then the way my life is at the moment is not really my fault and it is not anything I can do anything about. I just have to wait for the external event that will change everything. Now this does not mean giving up on their hopes for the future. Jeremiah is not suggesting that the exile will never end and that God will never bring them home to Jerusalem. Nor would he now be suggesting that we should forget about the promises of Jesus’s return in glory and the longed for dawning day of justice and peace. And nor is any of this to deny that your life may be greatly transformed by a new job or a new relationship or a graduation or whatever else it is that you are hoping for. But what it is saying is that your life is not to be put on hold until the big day arrives. Life can be lived, and should be lived to the full, in the present circumstances too. On the other hand, this also does not mean that the problems of the present circumstances are not to be taken seriously. There is another version of “living in the future” that doesn’t so much wait for the future day as try to pretend that it is already here, and burst with outrage when it isn’t so. There seems to me to have been an element of that in some of the media arguments about alcohol and sexual assault in the last few years. Several opinion columnists have argued that women should be able to go out and party with abandon without fear of predatory men taking advantage of their sexual vulnerability when they get hopelessly drunk. Now I quite agree. They should be able to. And I work and pray for the day when they can. But I also think that we should all be able to leave our houses and cars unlocked without fear of theft, but that day is not here yet either. We have to live our lives aware of the circumstances that actually exist, however unpleasant and objectionable they may be, not just the circumstances that we believe should exist. We are called to live in prayerful expectation of the day of the Lord when all things will be made new and the world will live in justice, mercy, love and peace. But such prayerful expectation is not to either stop us engaging fully with the life we have been given in the here and now, or stop us from facing up to and taking account of the risks and dangers of the present situation. The good news that Jeremiah is calling us to hear is that God is with us now, and life is a gift to be lived to the full now. As God has made known in and through Jesus, no matter what the circumstances now, even if you are being betrayed and crucified, God is with us and is active to redeem the circumstances and work through them to bring life out of death and hope out of despair. Life is a gift, and what you make of it in the present circumstances will play no small part in how good it will be when the circumstances change and the promises are fulfilled. Life is a gift. Embrace it. Give thanks for it. Share it. Live it. To the glory of God. I love these “no nonsense” (forget the hand clapping’s & amens for 10 minutes), but well thought out renditions (sermons) of the “real” meanings of our ancient wisdom documents that give us “meat” for getting on with our daily task of living a worthwhile life. This doesn’t mean that I don’t have time for standing in front of Icons and “getting lost” in the story. A time for understanding and a time for dreaming and we get “both hits” from this kind of preaching. These are truly messages of hope and celebration of the person and “ethos” of Christ.